In order to build more efficient and enjoyable places to live, citizens, municipalities, and corporations alike are looking to exploit and combine suites of information communication technologies (ICTs) and immense streams of data from urban-scaled sensor networks. The so-called smart city has been presented as a critical, strategic instrument in supporting the growth and resilience of urban environments. Our cities are already instrumented with robust sensor networks that monitor the location of city buses along their routes, the number of garbage bins yet to be picked up by municipal waste services, the discrepancy between rates of water consumption and the capacity of reservoirs, and countless other quantitative metrics of a city’s operation. Generic devices, such as phones, watches, cars, refrigerators, and street lights, are increasingly internet enabled and therefore have the capacity to continuously transmit data about their condition, location, and function. This rapidly proliferating collection of devices—of which the internet of things (IoT) is composed—further secures the important role that the management and use of data will play in the future of our cities. Ideally, the smart city should achieve an equilibrium between quality of life, civic accountability, and sustainable development. Yet despite this core promise, the manner in which smart-city ideals have been advanced is limiting, especially for its citizens. The role of data in the future of the built environment is currently entangled within different visions promoted by disruptive tech visionaries, ambitious municipalities, and private businesses who, to further their own interests or products, each vie for their respective vision of the smart city to be accepted as the vision for the smart city. In the last decade in particular, the prescriptive visions of the smart city promoted by global technology corporations, such as IBM and Cisco Systems, have been dominant. Since 2008, major initiatives by these corporations—epitomized by the IBM Rio de Janeiro Operations Center, which provides a centralized control room from which to manage all city services—threaten to reduce the promise of the smart city to a top-down operation that privileges the optimization of municipal services and business-oriented activities. Far from an equilibrium, the smart city has become skewed in favour of civic management over civic engagement and accountability. Recent initiatives, such as Sidewalk Toronto, a new smart-city initiative led by Google’s parent company, Alphabet, are attempting to differentiate themselves from their predecessors by emphasizing a people-centred, public realm as a defining component. Nonetheless, the persistent inclination towards centralized operations excludes the capacity of the smart city, supported by the IoT, to empower individuals to create new and inclusive ways to organize, use, and shape the places in which they live. Over the past decade, architects and allied design professionals have moved to counteract this narrower vision of the smart city by pursuing implementation strategies that foreground a more critical and citizen-oriented sensibility. By working in a more decentralized fashion and at smaller scales, architects are empowering citizen groups to vocalize and act upon local issues. The strength of such work is found in the symbiotic relationships being fostered between physical and virtual contexts. Rather than predetermining outcomes through generalized technological deployment, these designers explicitly engage particular stakeholders, situated physical settings, and related sociocultural or sociopolitical conditions to conceive and develop citizen-oriented and context-specific projects. As will be elaborated below, the outputs of these efforts are wide-ranging and can result in the creation of things like immersive experiences, participatory platforms, and responsive architectures. In each case, physical and virtual worlds are connected and new forms of civic engagement are made possible. Through this work, architects are actively exploring the potential relationships afforded by new computational capacities between material, form, data, and algorithms and their joint capacity to organize and mediate the built environment. Yet, within the context of a citizen-oriented smart city, a growing group of architects are further charging their software products by developing new digital tools and platforms to actively support their projects’ ability to sense, respond to, and interact with the real world. Categorized as Software-Embedded Design (SED), these projects directly engage computation by integrating custom software or code/data bundles to actively contribute to project outcomes and behaviours through time and space. By embedding these computational components and procedures, referred to as soft materials, into their work, architects have added elements such as data and algorithms into the conception of a project’s material assembly. The following two projects demonstrate the work currently shaping the future of software-embedded design. The Palimpsest, created by John Russell Beaumont, Haavard Tveito, and Takashi Torisu, combines human memories, city planning, and virtual reality to evoke the potential of information-inspired visualization to create more inclusive planning practices. (1) The project utilizes emerging digital technologies in virtual reality and 3D scanning to improve community engagement and participatory design in urban development projects. It allows communities to build a digital archive of neighbourhoods, homes, and urban spaces that are important and may be impacted by development projects. It also encourages all stakeholders involved in urban development to collaborate by providing a platform for sharing stories, opinions, and proposals. Initially conceived as an exhibition, OnTheLine converts a transit line into a gallery, connecting transit riders with the richness of the destinations along their route. The DATAlab research group created a suite of physical installations and digital interfaces to shape and present a collective identity of the region. (2) Utilizing bus shelters, buses, a centralized project display, an interactive website, and a mobile app, OnTheLine both transmits and collects information about activities, events, and destinations along the transit corridor. The project’s various sites, its collection and use of data, and its supporting media and technologies are combined into a comprehensive framework to support various modes of participation and, in turn, shape a citizen-driven identity for the region of Waterloo. Each of these projects leverages the spatial awareness of ICTs and their capacity to actively contribute to urban life and physical experiences. In each case, the project is increasing the number and extent of links between computational elements, material elements, and therefore its own potential outcome and behaviour. As these links become more complex, designers need to exercise awareness and control over the values and functioning encoded in their soft materials. To illustrate the potential scope of how architects can expand their engagement with soft materials, consider a brief, retroactive assessment of the use of data in OnTheLine in which two complementary sets of data contribute to the unified presentation of destinations for the project. First, the project presents a curated and centralized set of local cultural destinations and activities that has been pre-assembled by the project team from a suite of local information resources. Second, an emergent set of destinations submitted by the public, via social media mechanisms such as twitter hashtags, augments the list of presented destinations (see image 4). While the curated data drawn from sources such as the Ontario Heritage Trust and the Waterloo Regional Tourism group is subjected to manual processing, verification, and selection and ensured to be thematically relevant and spatially accurate, its inclusion is the result of an inherently biased process led by the project team. The emergent dataset has the potential to overcome such bias by crowdsourcing destinations for inclusion, but it also highlights a different set of considerations, which include evaluating barriers to participation through a reliance on smartphone technology. The emergent set also scores low on thematic relevance and spatial accuracy as it supports the inclusion of unfiltered and non-verified entries. While both datasets are stored and processed in equivalent ways within the software, the role they potentially play and their relative strengths and weaknesses vary. How are these differences in data quality accounted for in the project? Are barriers to participation important? How are they addressed? How important was objectivity in the project and was this value met in its implementation? This is only a sample of resultant questions that guide a critical understanding of the project’s datascape and that work to advance the level of computational literacy of the SED designer. Likewise, similar efforts can be extended to data’s counterparts, namely the algorithms used to define computational procedures driving the project. If we do not build such computational literacy, the ability to read digital project components in terms of both their technical implementation and their sociocultural agency, we run the risk of the physical and virtual components of a project being misaligned, counter productive, or even contradictory. A cautionary example of such misalignment was Boston’s StreetBump App, which used the motion-sensing capacity of smartphones in moving cars to report GPS locations of potholes that need repair. Unfortunately, given that residents of lower-income neighbourhoods had fewer smartphones and cars and therefore produced fewer reports, the city’s pothole list was grossly incomplete and resources were effectively diverted away from the populations with access to the fewest services. (4) While the app’s coding was technically well developed and it was easy to use and generally well appropriated by the population that had access to it, it produced significant, unwanted effects. The software failed due to a misalignment between the sociocultural factors embedded in the code/data bundles defining the software and the broader project goal to improve access to municipal services. In the case of the two experimental SED works presented here, the broader sociocultural and ethical impacts are controlled and mostly limited. However, as the field strives to counteract corporate-led visions of the smart city with a citizen-oriented approach and to move from test environments to real-world scenarios, the consequences of overlooking the agency of soft materials in project outcomes become significant. Further, while these two projects rely heavily on virtual interfaces, namely screens, to engage with their computational components, the need for greater awareness and control of soft materials becomes even more important as SED work advances and tighter bundling is pursued between the physical and virtual. We need only to look to Philip Beesley’s sculptures and installations, (5) which ambitiously blur the boundaries between materials, sensors, software, and control, to imagine how interrelated these elements may become in service of creating a living architecture. 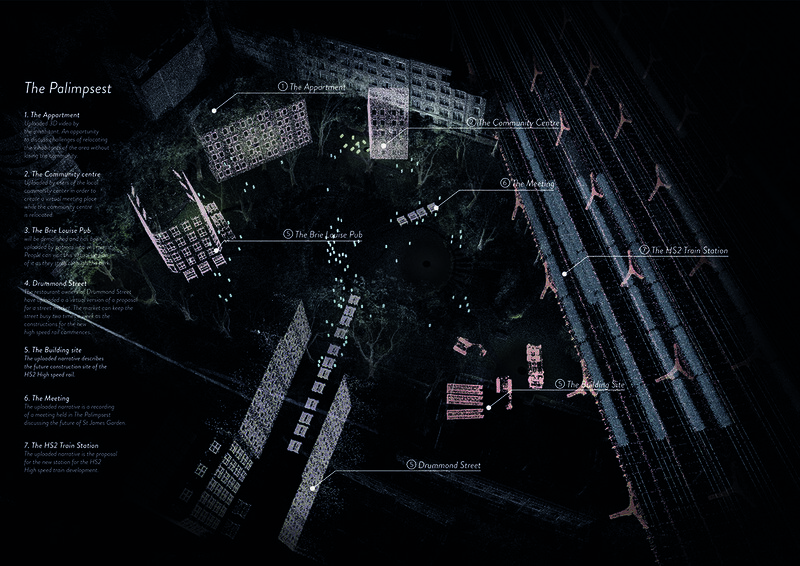 While the specific manner in which architects will develop this expanded form of computational literacy is yet to be determined, it is essential that they integrate critical sociocultural and ethical questions into data (its sources, formats, and selection), algorithms (their design, implementation, and deployment), and coding culture (its values, diversity, and access) in order to holistically confront the impacts of their design work. Without this more inclusive definition of computational design literacy, moving beyond technically oriented concerns, the goal for SEDs to offer alternative, citizen-oriented, civically accountable smart-city implementations are undermined. (1) John Russell Beaumont, “The Palimpsest,” 2017, http://www.johnrussellbeaumont.com/the-palimpsest. (2) OnTheLine was developed by DataLAB at the School of Architecture at the University of Waterloo in 2014. Project Leads: Mona El Khafif and Maya Przybylski. Student Design Team: Zak Fish, Lea Koch, Daniel Malka, Thomas Noussis, and Jake Read. (3) The field of software studies offers key insights as to how to read soft materials in and of themselves as having the capacity to support, enhance, and undermine values and outcomes. Software studies positions software—its actual lines of code and data, not just its effects—as a material practice with both social and spatial outcomes. See for example, Matthew Fuller, ed., Software Studies: A Lexicon (Cambridge MA: MIT Press, 2008); Rob Kitchin and Martin Dodge, Code/Space: Software and Everyday Life (Cambridge, MA: MIT Press, 2011). (4) Kate Crawford, “The Hidden Biases in Big Data,” Harvard Business Review (April 2013), https://hbr.org/2013/04/the-hidden-biases-in-big-data. 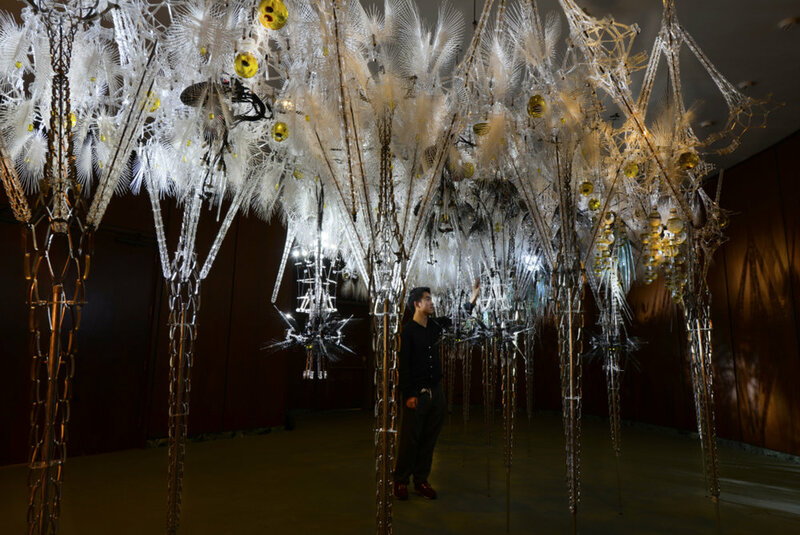 (5) Philip Beesley Architect, “Sculptures & Installations,” http://philipbeesleyarchitect.com sculptures/index.php. Maya Przybylski is an Assistant Professor at the School of Architecture at the University of Waterloo where she runs the DATAlab research group. She combines backgrounds in computer science and architecture to develop methods for achieving more complete engagement with both the sociocultural agency and technical capacity of the computational components embedded within design work. She is an editor of [Bracket], a publication series that documents the intersection of architecture, environment, and digital culture.